So I'd thought with less than a month until synchro season starts and I am back in the water, I wanted to try a style I have been sooooo hesitant to try but I figured it's less than four weeks I would have to wear this so it can't be too bad. Introducing my phases of Blow Dried Straight Double Strand Cuban Twist crochet braids in the #4 color. I thought these pictures accurately not only represented the often times scary process of installing this extremely textured hair but also the disappointment that comes with it and then the somewhat pleasant results you can achieve from styling it. 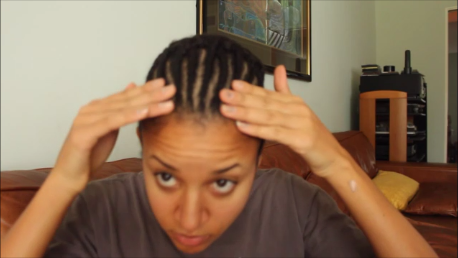 I found this cornrow pattern from a Kymberli Brenzell video online. The only difference was that I did a beehive cornrow pattern in the back so I didn't have to deal with the rat tails and all that. I found online there was not a really good specific video showing or explaining well how to do the knotless technique, it looks simple but then I realized it matters what direction your crochet needle is going for the part to look natural! This is the most time consuming part. All that hair you got to get straight. Once that is finished blow dry on high heat (make sure to do a test strip before to make sure your setting doesn't melt the hair!). Don't use a blow dry comb attachment. I tried using a comb and a blow dryer and it wasn't really working out unless you have someone helping you. Otherwise just keep oscillating the blow dryer from root to the tip, holding the hair straight while doing this. Afterwards the hair should be more comb through at that point - I used a wide tooth detangle comb. I definitely have to paddle comb it a little every morning and trim the ends after for any straggly ends. Sleeping with it is a little interesting. It is not like how I traditionally do it with long crochet braids like twisting it up at night. I generally just do it like if I had a press in, paddle combing it around my head like a honey comb then putting on my night cap - same concept can be applied here. 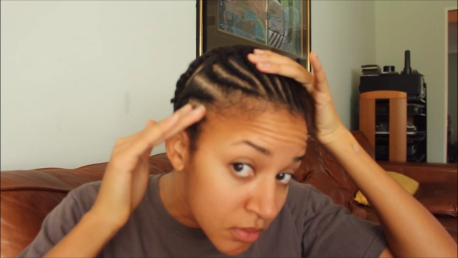 I have to say, this is one of those love hate crochet braids styles where one minute I am like this is awesome and another minute I'm like I just want to cut this out of my head and wear a wig for the next three weeks. It does take more patience and time than I am used to in comparison to other crochet braids styles - in terms of installation and maintenance. But the versatility is wonderful!!! I have really been enjoying the different styles I can wear which has been the silver lining for the whole experience. I am curious how it is going to hold up as time goes on and I am going to attempt to curl it again even after my failstyle a year or so ago. Crossing my fingers no hot water burns!